Low-weight, highly stable channel body with or without slope and front-end safety seam. In addition to the 90 mm standard construction height, the MINI channel with a construction height of only 55 mm is unique on the market. Concrete components of up to 140 mm in total height are available in the slope. 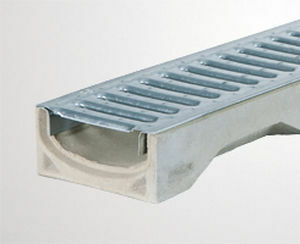 Slotted-/mesh gratings and ductile iron mesh grates up to load class C 250 kN complete the range. The grates are locked into position with patent and fixing clips. zones, sports complexes, domestic driveways and similar areas.